As regular readers will know, my car has a programming interface which, sadly, is not officially supported by BMW. Still, it lets me create some little apps to improve the daily experience of car ownership; not something I’ve really been able to do with any previous cars. We’ve come a long way from some of my earliest ones, where I spent most of my time straightening bent carburettor needles and replacing leaf springs! My latest hack is a little script which runs periodically on one of my servers and checks whether the car has been stationary for more than 15 mins. If so, and the windows, sun roof or doors are open or unlocked, it sends a notification to my phone. This is partly for security reasons, but mostly because the British weather has been sending us hourly alternate bursts of sunroof-opening heat and torrential downpours! 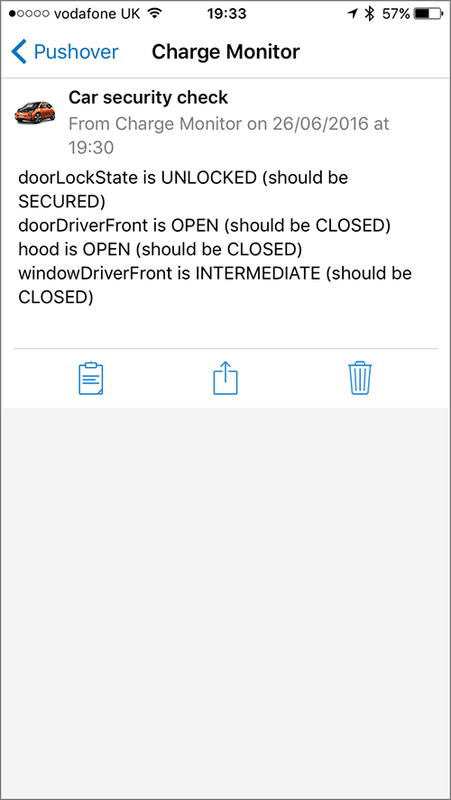 Of course, if I’m not near the car at the time, I can lock it remotely. One of the many things I find appealing about the move to electric cars is that the actual mechanics become so much simpler. I no longer have an exhaust pipe, a clutch or gearbox, an oil sump or filter, head gaskets or piston rings. The motor isn’t much larger than a melon, and the batteries can be made in various shapes and sizes to fit the layout of the vehicle. In my case, I have a flat floor, with no propshaft tunnel or gear lever to get in the way. Reconfiguring such a design to be a van, a campervan, a flatbed truck, or whatever, is much less of a challenge now. As the complexity of the mechanics goes down and the flexibility goes up, I think software, both inside and outside the car, is going to play an ever more important role in our experience of it. The automotive industry has become interesting again, for the first time in many decades.